Logoclothz updated their range of promotional custom printed tablecloths for schools and universities interested in a high-quality image that will help their table be noticed at their upcoming trade show, exposition, college orientation, rally, and others. 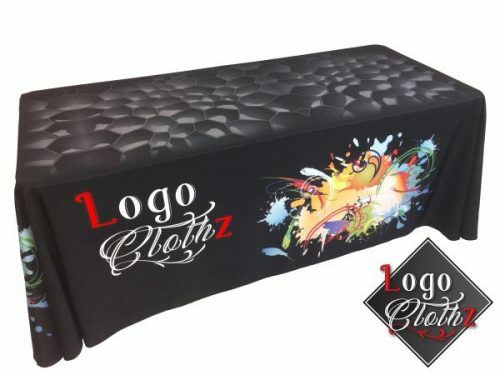 Logoclothz, a Homestead, Florida based company specialized in promotional custom tablecloths, announced the launch of an updated range of custom table covers and runners for schools and universities. Custom tablecloths are ideal for marketing one’s brand and making it more visible at trade shows, conventions, expositions, job fairs, and many more. Custom logo printed tablecloths, table runners, fitted table covers and table skirts are a great way to brand a company at a show, display, sale or special event. Trade shows, conventions, and fairs are also very popular venues for schools and universities, athletic teams, as well as community and civic organizations. Logoclothz’s table throws create a unique foundation for successful expositions, college orientations, rallies, club meetings, or other types of special occasions in auditoriums, gymnasiums, boardrooms and at outdoor events. Logoclothz creates branded table covers and tablecloths that will make a school or university look great, draw attention and make positive impressions. This will help market their brand and present people with information, such as how to contact them right away in a professional and stylish way. The company works closely with clients to ensure their tablecloths make their institution proud to display a custom logo and message. They cater to all education authorities, government and military. Clients can print their logo in full color or spot color on many choices of fabric color. Whether they need branded table runners or throws in 4-foot, 6-foot or 8-foot lengths, Logoclothz can attend to their individual requests. In addition, Logoclothz has a PO system that allows schools and other education entities to order directly from the website. For every table cover sold, clients get to choose a charity they would like to donate to. Interested parties can find more by visiting the above-mentioned website or calling +1-833-420-5646.